Welcome! The link and the title track where we are in our plan to read through the entire Bible in 1 year. May each report pique your interest and help you to draw near to God. The Bible, James 4:8, tells us if we do so God will draw near to us. Works cited are at the end of the report. Internal links provide additional information. Bible quotes, unless otherwise indicated, are from the ESV. Note: Jacob's and Esau's birth is recorded in Genesis 25 (about 2006 B.C.) and the events unfolding in Job happened shortly thereafter. Jesus spoke about the Final Judgment about the year A.D. 30. The difference is 2036 years, so Job lived about "2000 years before Christ was born." ​BIBLE READING—WEEK 23—JOB 11-34: Last week’s report looked at the book of Esther by considering Esther’s place in Scripture, God’s presence in the book, and what Purim means to the Jews. This week’s Short Report focuses on Job, who is first proven to be an innocent man—not perfect, but blameless—who then suffered more than most men could endure, and who in the end was renewed by God. 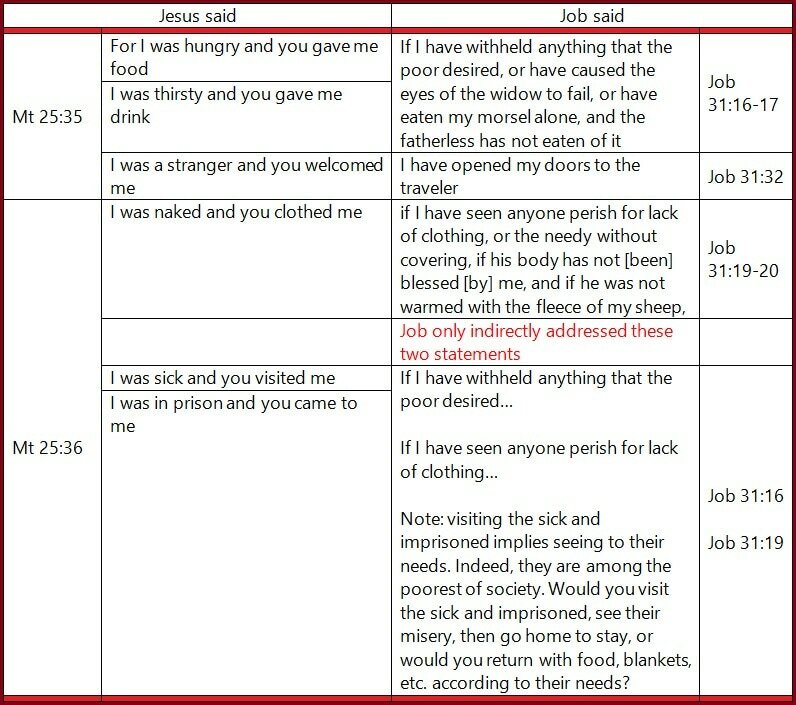 In many ways Job was a type of Christ. Generally speaking a Biblical type is something from the Old Testament that anticipates something in the New Testament. In Romans 5:14, for instance, Paul tells us that Adam was a type of Christ. The book of Job is large enough to be mentioned in three weeks of our Bible reading program. However, last week’s report focused only on Esther and next week starts a four week period across the book of Psalms, so Job’s 42 chapters will be condensed into a single report this week. By presenting the many different opinions on Job’s timeline some commentaries can leave us to wonder about when—in which century even—the book was written, and the time period when the events in Job took place. I agree with Halley, who says the modern scholarship that places the book of Job at a later date (century) “is only a guess.” Halley also prefers an early date for the events in the storyline because “the book has the atmosphere of very primitive times and seems to have its setting among the early tribes descended from Abraham, along the northern border of Arabia, about contemporary with Israel’s sojourn in Egypt” (Halley’s Bible Handbook, 241). In addition, we also have Bible genealogy to help us pinpoint Job’s timeframe. Job’s friend Bildad, a Shuite, was a descendant of Abraham through his marriage to Keturah (Gen 25), after Sarah’s death. Elihu the Buzite was a descendant of Abraham’s brother Nahor through his son Buz (Gen 22). This genealogy, in relation to Job’s story, is certain, and points to a time shortly after Abraham’s death. However, Eliphaz (not Eliphaz the Temanite) is listed as Esau’s first son (Gen 36), if they are one and the same, which is not certain, it is possible that the lives of Abraham and Job overlapped. On the other hand, we see in Genesis 36:15 that Eliphaz had a son named Teman. We know nothing more of the Temanite clan, although Teman or one of his sons may have had a son named Eliphaz, who would be call Eliphaz the Temanite. This seems more likely. Either way, Bildad’s and Elihu’s lineage shows that Job’s story comes to us from a time just after Abraham and before the Hebrew nation was formed, and parallels events taking place in the latter half of Genesis. Speculation about human authorship Moses (? ), King Solomon (? ), etc. does nothing to help us date the book, nor provides insight to the book’s message, which comes to us by God’s Spirit and His design. The book itself has several natural divisions: Setting One: Job is introduced and twice his faith in God is put to the test (Job 1:1-2:9). Setting Two: Job is visited by three friends, then a fourth, whose original intent is to comfort him, but a series of discussions take place where Job must defend himself or assume the guilt they assign him as the cause of his afflictions (3-37). Setting Three: God enters the conversation to set the record straight; He rebukes Job and Job’s three friends and then renews all aspects of Job’s life (38-42). In the first setting Job is placed in the balance and weighed. His adversary, and ours, was given permission to destroy his life and take his children and everything he owned, which was vast. Even so we are reminded that God was in control and did not allow Satan to take what he wanted the most, Job’s life (Job 2:6). No doubt Satan did his worst and Job was totally devastated, but Job’s faith remained strong. The transition into the second setting is brief, as Job’s friends come to provide comfort we are told that Job was so overcome by sickness his friends did not recognize him. They cried out loud, tore their clothes, covered themselves in dust, and sat with him in silence for an entire week (2:11-13). Speaking to Job’s health Halley tells his readers, “Job’s Disease is thought to have been a form of Leprosy, complicated with Elephantiasis, one of the most Loathsome and Painful Diseases known to the oriental world” (p. 243). It is Job that breaks the silence, in chapter 3, as the second setting opens when he cursed the day he was born and says, “May God above not seek it, nor light shine upon it … Why did I not die at birth, come out from the womb and expire? … For my sighing comes instead of my bread, and my groanings are poured out like water. In this section of Holy Scripture Job speaks nine times, Eliphaz and Bildad three times each, Zophar twice, and Elihu speaks once. Eliphaz speaks to Job first, and tells him he is not innocent, because the innocent prosper. By way of contrast he asserts, "Those who plow iniquity and sow trouble reap the same" (4:8). When Eliphaz next speaks he claims Job does not fear God (15:4), nor does Job listen to God's council, rather he "defies the Almighty" (v. 25). In his final dialog Eliphaz places Job among the wicked goats in the final judgement found in Matthew 25:31-46, for there Jesus says, "I was hungry and you gave me no food, I was thirsty and you gave me no drink," and Eliphaz tells Job, "You have given no water to the weary to drink, and you have withheld bread from the hungry” (22:7). In turn, Zophar is the third friend to “comfort” Job. Bildad is the second, but also the last of the three, so I’ll finish with Bildad and cover Zophar now. His “advice” is presented in chapters 11 and 20. In the former he claims God is letting Job off easy, that Job deserves worse than he got, while in the later chapter he informs Job the wicked, like him, are bound to suffer. In addition, some of Zophar’s words suggest he still had knowledge, not personal knowledge but knowledge born of oral tradition, which would be typical of society before books and public libraries, of the Tower of Babel (Genesis 11), for he says, “Do you not know this from of old, since man was placed on earth, that the exulting of the wicked is short, and the joy of the godless but for a moment? Though his height mount up to the heavens, and his head reach to the clouds, he will perish forever like his own dung; those who have seen him will say, ‘Where is he?’” (Job 20:4-7). Bildad believes Job's children were guilty and so is Job, and he wants Job to repent. In Job 8:3 he asks a rhetorical question: “Does God pervert justice?” The answer is no (Deuteronomy 32:4; Psalm 7:11), but man, and Satan before him, both pervert justice all the time, which the book of Job attests to. Bildad speaks again in chapter 18 where he lists the problems that befall the wicked. He counts Job among them saying, “He has no posterity or progeny among his people, and no survivor where he used to live” (v. 19). This leads into chapter 19 where Job utters one of the brightest Biblical gems: “I know that my redeemer lives, and that in the end he will stand on the earth” (v. 25, NIV-1984). Keeping in mind that this is the time of the patriarchs, a time when the father was the head of the clan and the family priest, it is not difficult to image the story of the Fall, or the Flood and the promise of a Redeemer being shared around an open fire, a family meal, or a time of worship long before the first book of the Bible, Genesis, was penned by Moses. Still, it is awesome to hear Job say the words! Ellhu is the last man to speak, and he speaks at length (Job 33-37). He is also a fair mediator pointing out the faults on both sides, and a loyal defender of God. God, however, leaves him out of the equation and so will I. In the third setting God first address Job. He makes it clear that He is the Creator of the universe, the earth, and everything on it, and He has full control over all that He has created. After all, who was there “when I [God] laid the foundation of the earth?” (38:4) And “Shall a faultfinder contend with the Almighty?” (40:1) Or, for that matter, a created Being oppose his Creator? Job’s answer is to remain silent (v. 4), and God continues to press him. God’s anger is well known (perhaps Holy Indignation is a better term), three examples follow. In Numbers 32:13 we are told ”the LORD'S anger burned against Israel,“ and in 2 Kings 13:3 we read that “the anger of the LORD was kindled against Israel.” Also, in Matthew 21, Jesus overturned the tables of the moneychangers. "God is holy; he totally and completely distances himself from sin, evil, corruption, and the resultant filth and guilt. He maintains his purity and rejects, fights against, and destroys that which would offend, attack, or undo his holiness and love. Hence, God's anger and wrath must always be seen in relation to his maintaining and defending his attributes of love and holiness, as well as his righteousness and justice. The emotion or passion that moves God to this maintaining and defending is expressed by the terms "displeasure," "indignation," "anger," and "wrath." A consequence of his wrath is vengeance, punishment, and death." When God’s anger subsides Jobs repents (42:1-6). Then, God turns His attention to Bildad, Eliphaz, and Zophar. Perhaps this is why God spent so much time “chewing out” Job, who during the whole ordeal never was given more misfortune or suffering than he was able to bear, because God never allows us to be tried beyond our ability to withstand the temptation (1 Corinthians 10:13; 2 Peter 2:9). Moreover, God refers to Job as His servant that spoke righty (vv. 7 and 8). While Job’s three friends witnessed God’s interaction with Job they also should have taken stock of their own situation and repented alongside Job. It would seem that they felt justified in the way they “corrected” him. Perhaps they even felt in league with God while He addressed Job, but they had another thing coming. God abruptly brought them back to reality telling them that His anger burned against them, and commanding them to “take seven bulls and seven rams and go to my servant Job and offer up a burnt offering for yourselves. And my servant Job shall pray for you, for I will accept his prayer not to deal with you according to your folly. For you have not spoken of me what is right, as my servant Job has” (v. 8). Seven is the number of completeness, a bull represents the herd and the ram the flock, and the burnt offering is an offering of total dedication to God. Job is utilized as the high priest through prayer and sacrifice made on behalf of his friends, a mediator between God and man. That and his great suffering while being innocent of the charges the adversary brought against him are two examples of Job as a type of Christ. At the end of His earthly ministry, Jesus was resurrected and glorified. At the end of Job’s story he is renewed and all he lost is restored to him twofold. We are told Job lived an additional 140 years, but we are never told his age. Abraham lived to be 175, his father, Terah, was 70 years old when Abraham was born (Genesis 11:26), which was common in the age of the patriarchs. If Job was in that age group when the first of his ten children were born, who were adults with homes of their own at the time of Job’s ordeal, Job could easily have been 100 years old when his trial started, meaning he was about 240 when he was laid to rest. Perhaps James is thinking of Job when he says, “Count it all joy, my brothers, when you meet trials of various kinds, for you know that the testing of your faith produces steadfastness. And let steadfastness have its full effect, that you may be perfect and complete, lacking in nothing” (James 1:2-4). And again he says, “Let no one say when he is tempted, ‘I am being tempted by God,’ for God cannot be tempted with evil, and he himself tempts no one” (v. 13). And Peter must have Job 1:7 in mind when he writes, “Your adversary the devil prowls around like a roaring lion, seeking someone to devour” (1 Peter 5:8). And on the subject of trials he writes, “In this you rejoice, though now for a little while, if necessary, you have been grieved by various trials, so that the tested genuineness of your faith—more precious than gold that perishes though it is tested by fire—may be found to result in praise and glory and honor at the revelation of Jesus Christ” (1 Peter 1:6-7). This short report looked at the life and times of Job, a man of means that feared God and lived a life of reverence towards his Creator and his fellow beings, who was put to the test and found to be a loyal servant of God. Like Christ, he suffered much although he was innocent of the charges brought against him. He also served as a mediator between God and man, namely, his friends and saved them from paying the penalty for their folly before the Lord. In the end his trials were turned to gold. BibleStudyTools. Dictionary, wrath of God. Web. 8 June 2017.